Looking for a recipe for homemade aluminum-free baking powder? No? Maybe you should be! Thinking that maybe this “make your own stuff” has gotten a bit out of hand, eh? Just yesterday, one of my readers was looking for a recipe for a baking powder substitute due to special dietary needs. So I dug out this recipe and am sharing it with her — and with all of you — today. In one sense, I guess this shows how far I am willing to go to modify a special needs diet, but it also shows how easy it can be to do so. 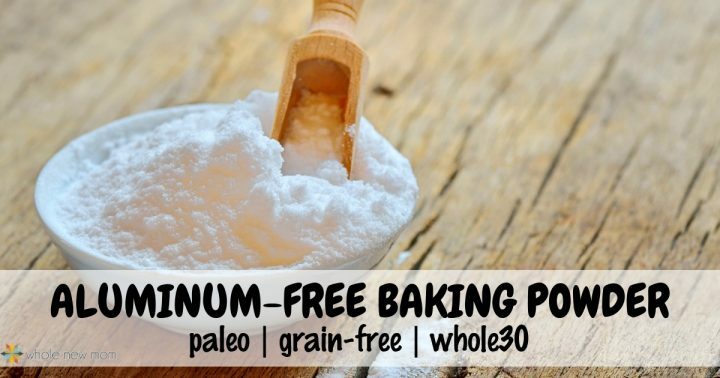 Why Make Your Own Aluminum-Free Baking Powder? Your Baking Powder doesn't expire. You are on a special diet. 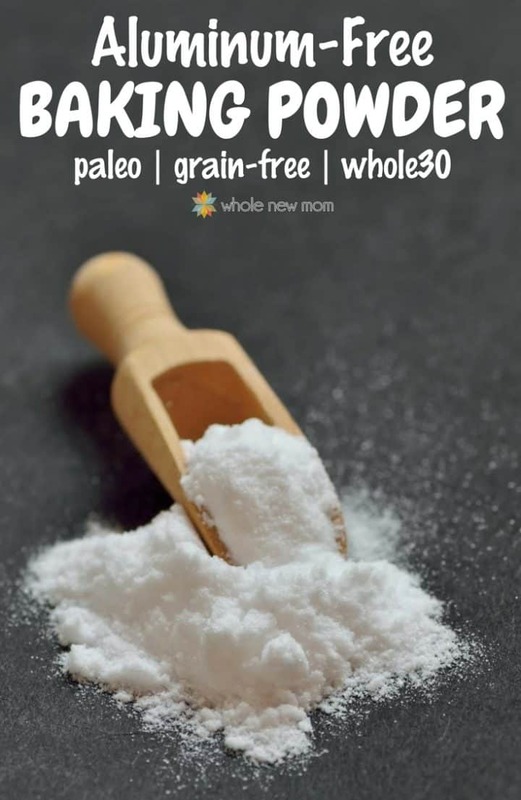 This Homemade Baking Powder is whole30, paleo, AIP (autoimmune paleo), gluten-free, THM and more! Before I tell you about why we chose to make our own Homemade Baking Powder, I've just got to tell you about a Baking Powder Expiration story. My Expired Baking Powder Experience…. When I was little, cooking and baking were some of my favorite activities. One day I had a friend over and we decided to bake a cake. It smelled lovely and we were eagerly awaiting sitting down and enjoying the cake. We took the cake out of the oven, and let it cool, but then got a not-so-nice surprise. The cake, was hard. As in — very hard. So hard, and flat, that we ended up tossing it around the house like a frisbee. At one point it even struck my shin, and it hurt. I don't recall when we figured out the cause of the problem, but the reason for the frisbee cake was expired baking powder. I don't always make my own baking powder, but I have. And when I don't, I use non-GMO, aluminum free Rumford Baking Powder. However, there was a time during our path towards health (that we are still on, ahem) when my oldest son and I underwent IgG food allergy testing. Both of us turned up as being sensitive to corn and so we need to remove it from our diets for three months. Ever tried to take corn out of your diet for three months? How about for three days? It isn't easy. Now, avoiding tortilla chips, popcorn, and plain corn is hard enough. But even for this family that strictly avoids corn syrup, if you really get into the nitty-gritty of ingredient labels, you will find that corn is in everything. Well, one of the surprises that I got when I went into my cupboard to look for the offending ingredient on every label was that baking powder contains corn. I was not willing to give up baking, so I went hunting for a baking powder substitute. So here is one of the mainstays in my special diets recipe repertoire. Oh, and one of our family's favorite low carb recipes that calls for a good amount of baking powder is my Oat Bran Muffins. 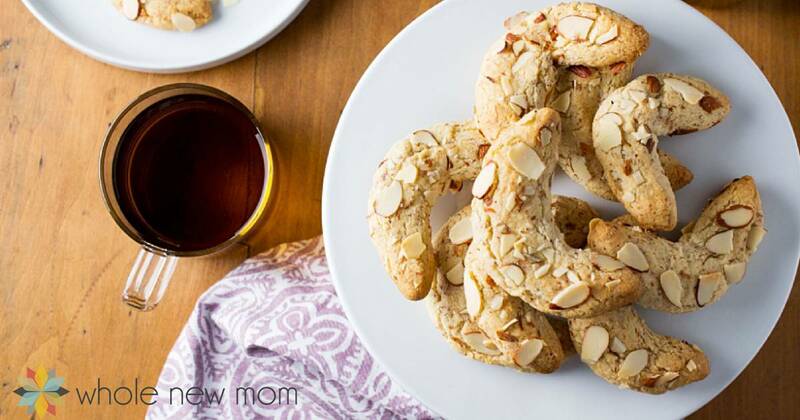 You just might want to give them a try with your new homemade baking powder substitute! Anyhow, I found that there are several baking powder substitutes, but this recipe for Homemade Baking Powder is the one that I use the most. It's shelf-stable and can be made ahead in bulk, which is a huge plus. You can use organic tapioca flour / starch instead of arrowroot, or, if you are not avoiding corn, organic cornstarch may be substituted. 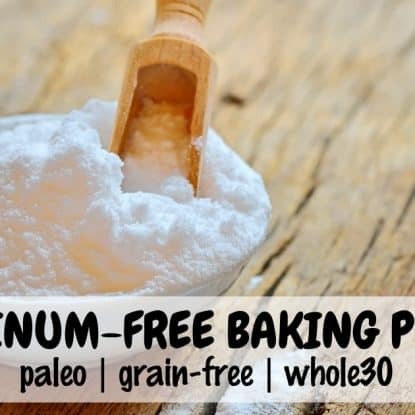 This Aluminum and Corn-Free Baking Powder Substitute helps ditch toxins, plus it's allergy friendly and grain free too. Blend all ingredients with a whisk to mix well. Use as you would regular baking powder. Store in a tightly-closed container to prevent moisture from entering and causing the ingredients to begin to react. Will you be trying this Homemade Aluminum-free Baking Powder? Good question. Typically for something like this where you are blending items, the shelf life will be that of the ingredient w/ the shortest shelf life so it depends on how fresh your ingredients are. You can have animal products, just less. Choose organic, and stay away from the animals that are fed corn and soy (which was why I was reacting to the meat). Anyway, Hope you read the book, the Plant Paradox, by Dr. Steven Gundry. It’s $30 at Barnes and Nobel, and $20 on Amazon and SO worthwhile. I have actually been looking at his information yesterday and today. Not sure what to make of it. I think some of it makes sense but some is very confusing. Can you tell me what you would recommend of her DNRS? I would like to try it. As for the Plant Paradox, I wonder about his study. It states that 93% of people had complete remission. This seems pretty unbelievable to me since I am in groups where people are talking about this diet and many / some say it didn’t help them. I wonder if he handpicked these success stories? Not saying it might not be a huge help, particularly if someone is eating the SAD diet, but I hope that makes sense. 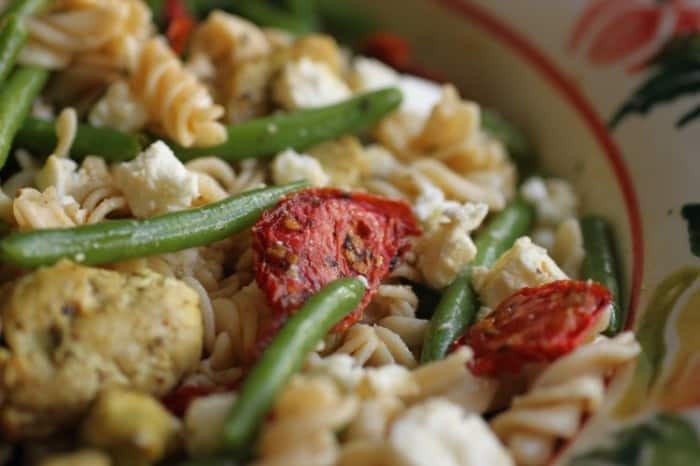 Also the lectin thing is a little odd – cooking and soaking, etc., is known to greatly reduce lectins. I read that that might be the case but for people who are sensitive that would still be a problem, and that maybe 94% of the lectins are gone, but the remaining 6% is a problem. However…if that’s the case, then almost all foods should be off the diet b/c other foods for sure have that same amount of lectins in them. I really would like to know how his study was performed and what the eating habits were of those who did the program. Does that make sense? Look forward to hearing from you on the DNRS – thank you! Annie Hopper’s book, Wired for Healing, discusses harnessing your brains amazing neuroplasticity. ($18 Amazon). This book does not (and never claims to) give you the HOW TO FIX IT, because, simply, DNRS is too involved for a “5 easy steps” book. It’d be several books. You can order the DVD’s ($250?-$300?) and commit to investing the time to put it into practice. I went to an in person seminar. Between what I learned there and what I’ve learned from reading Dr. Gundry’s super informational and practical Plant Paradox (very much a How-To book), I have a far better outlook on my future. Now, only when my body is in some sort of crisis (an accident, surgery, etc) do I have to be more careful of avoiding triggers or ALL of my autoimmune issues come roaring to life – the fibromyalgia, thyroid issues, carpal tunnel, skin, allergies, irritable bowel, and on and on . But I now have such a better understanding of what can cause issues and why, and I have more many more tools do deal with it all. Yay! Hi there. I have been looking more into her material. It’s interesting. The only concern I have right now is that I hear she has recommended people go off of their supplements and just do her DNRS–seems like a not too smart thing to me. As for Plant Paradox I think that’s interesting as well but I have concerns / thoughts there too. About lectins being the issue. Not that they aren’t for sure, but his food list is inconsistent. I should write a post about it. I would like to ask–have you thought about if you could have mold in your home? Glad you are doing better! By using some of the info in Plant Paradox book (only a $20 investment) and the DNRS (less than $300 for DVD’s) I have radically changed my outlook and health. I simply do not believe anyone on the DNRS team would tell you to go off supplements – anyway, it would be up to you. It’s pretty common sense. You’ll most likely find that you don’t need many of them eventually, but surely that’s your choice. As far as mold – it is everywhere. If you’re compromised your body can put up a fuss to even teensy traces of mold, but once you are healthier, your body can detox itself pretty well with no conscious interference. I’d once thought I’d have to rip out walls and floors because of mold only I could smell, but now … it is not an issue. In fact that sensitivity was among the first issues to resolve itself. I am so so glad to hear that you are doing better! I think the mind is definitely connected. The lectin thing appears to me to be a mixed bag. I think they are an issue but then I read that they are beneficial too and the whole balancing act re: what foods are allowed and what aren’t seems confusing to me. Did that part make sense to me? Wow, LYNN – I came on here looking for a corn free baking powder because I, too, am now following Dr. Gundry’s Plant Paradox program. 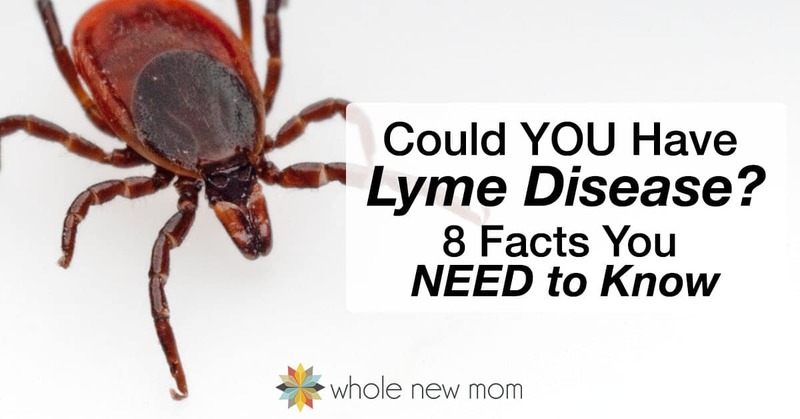 What it does is help anyone with autoimmune issues (I have had Thyroid issues, fibromyalgia, allergies, and a far longer list) and also addresses diabetes, cancer, heart disease, skin trouble, and then some. Over the last couple decades I had learned for myself the hard way I had to avoid corn, soy, wheat, and nightshades (even sunscreen) etc. Gundry sheds light on why meat was bothering me (it is fed corn/soy) and a whole host of other things people ought to know. HIGHLY recommend. I also have his cookbook and suddenly am baking and cooking lots, so needed corn free baking powder that was also potato free. So THANKS MUCH Adrienne! Hi there – so interesting to hear this. I will check it out. So they are saying that you eat no animal products at all? What is the situation re: the sunscreen? I glanced at the information but I don’t eat lots of what he forbids, but checking it out anyhow. What does he think about soaking grains and beans to deal with the lectins? Thank you for the baking powder recipe. I am not only a celiac I have severe corn and soy allergy. I follow the Plant Paradox diet and you should post this as lectin free as well because a lot of people will love it and Dr Gundry has a great Mug Muffin recipe that calls for baking powder but those without the corn allergy can handle a little bit, I cannot. Thanks, Lynn! Do you think just mentioning this in the post would be enough? I haven’t looked into that diet. What is it supposed to do? Glad to have helped!